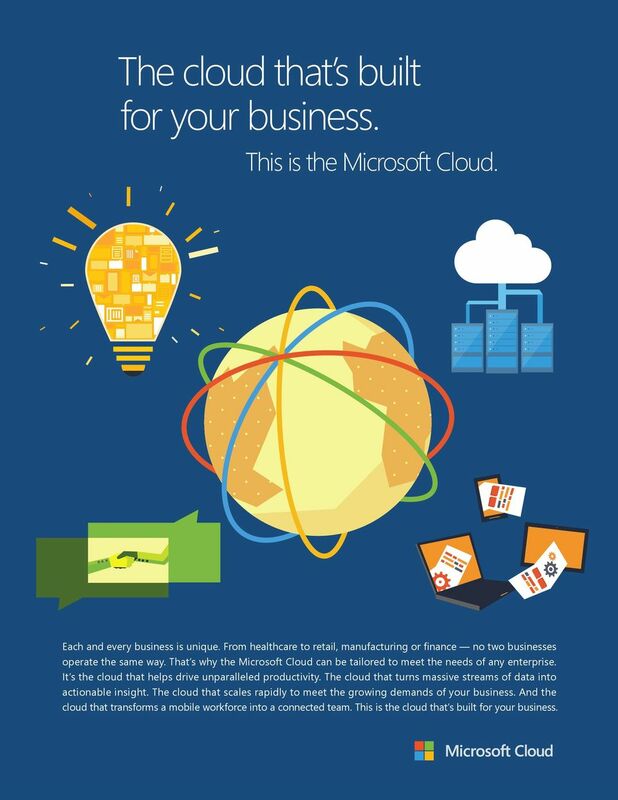 Download "The cloud that s built for your business." 1 The cloud that s built for your business. This is the Microsoft Cloud. Each and every business is unique. From healthcare to retail, manufacturing or finance no two businesses operate the same way. That s why the Microsoft Cloud can be tailored to meet the needs of any enterprise. It s the cloud that helps drive unparalleled productivity. The cloud that turns massive streams of data into actionable insight. The cloud that scales rapidly to meet the growing demands of your business. 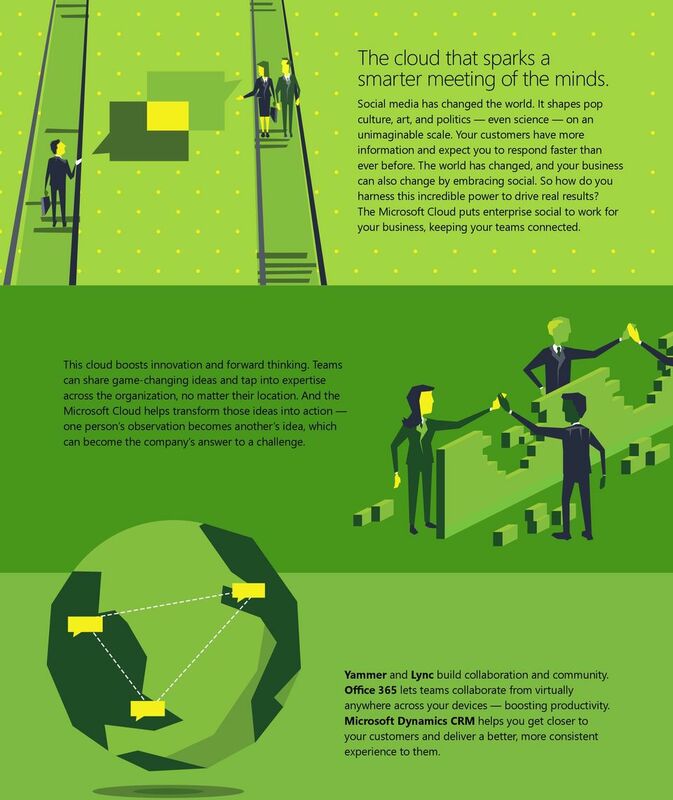 And the cloud that transforms a mobile workforce into a connected team. This is the cloud that s built for your business. 2 The cloud that transforms data into business decisions. The rise of social, mobile, and cloud technology has created a world of data that s growing almost infinitely. But how can you leverage this information to help drive a competitive advantage for your business? The Microsoft Cloud puts real-time data in your hands, so you can make better-informed decisions. 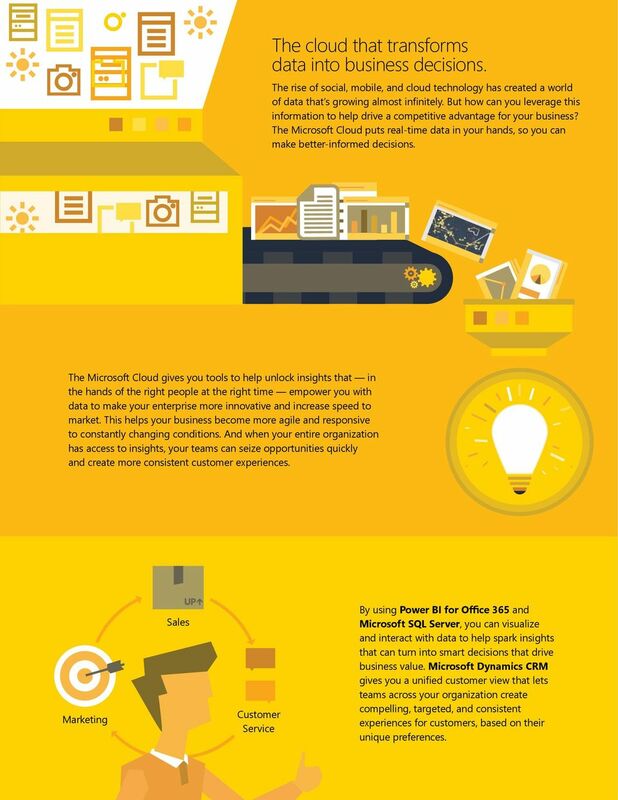 The Microsoft Cloud gives you tools to help unlock insights that in the hands of the right people at the right time empower you with data to make your enterprise more innovative and increase speed to market. This helps your business become more agile and responsive to constantly changing conditions. And when your entire organization has access to insights, your teams can seize opportunities quickly and create more consistent customer experiences. Marketing Sales Customer Service By using Power BI for Office 365 and Microsoft SQL Server, you can visualize and interact with data to help spark insights that can turn into smart decisions that drive business value. Microsoft Dynamics CRM gives you a unified customer view that lets teams across your organization create compelling, targeted, and consistent experiences for customers, based on their unique preferences. 3 The cloud that unleashes your workforce. In today s connected world, work doesn t happen only at work. Being productive means having the ability to create, share, and collaborate from virtually anywhere. So how do you turn your workforce into a force to be reckoned with? 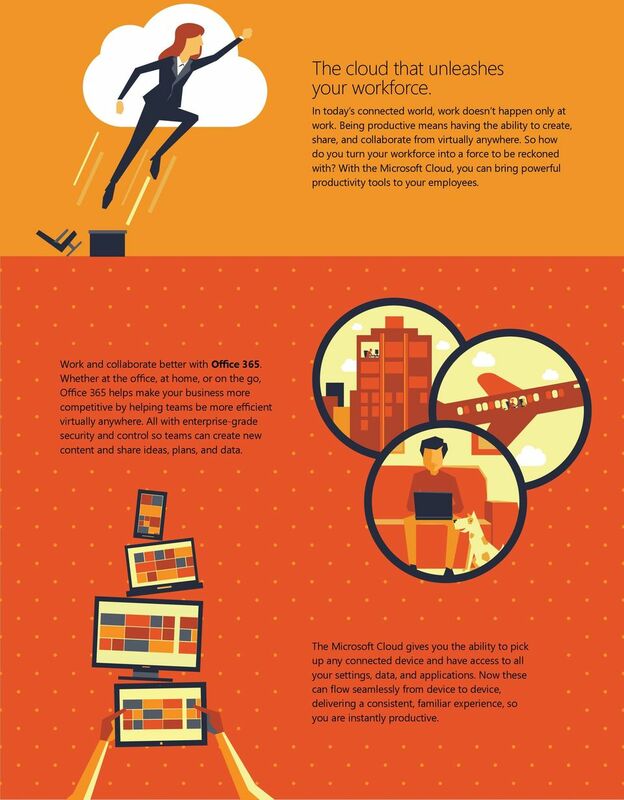 With the Microsoft Cloud, you can bring powerful productivity tools to your employees. Work and collaborate better with Office 365. Whether at the office, at home, or on the go, Office 365 helps make your business more competitive by helping teams be more efficient virtually anywhere. All with enterprise-grade security and control so teams can create new content and share ideas, plans, and data. The Microsoft Cloud gives you the ability to pick up any connected device and have access to all your settings, data, and applications. Now these can flow seamlessly from device to device, delivering a consistent, familiar experience, so you are instantly productive. 4 The cloud that sparks a smarter meeting of the minds. Social media has changed the world. It shapes pop culture, art, and politics even science on an unimaginable scale. Your customers have more information and expect you to respond faster than ever before. The world has changed, and your business can also change by embracing social. So how do you harness this incredible power to drive real results? The Microsoft Cloud puts enterprise social to work for your business, keeping your teams connected. This cloud boosts innovation and forward thinking. Teams can share game-changing ideas and tap into expertise across the organization, no matter their location. And the Microsoft Cloud helps transform those ideas into action one person s observation becomes another s idea, which can become the company s answer to a challenge. Yammer and Lync build collaboration and community. Office 365 lets teams collaborate from virtually anywhere across your devices boosting productivity. Microsoft Dynamics CRM helps you get closer to your customers and deliver a better, more consistent experience to them. 5 The cloud that provides a connected platform for your business. As you adopt new cloud technology, you should be able to leverage your existing datacenter investments. New solutions should connect with existing resources and make things faster, more efficient, and more flexible. So how do you plan for future growth without building cloud infrastructure that is too complicated to manage? 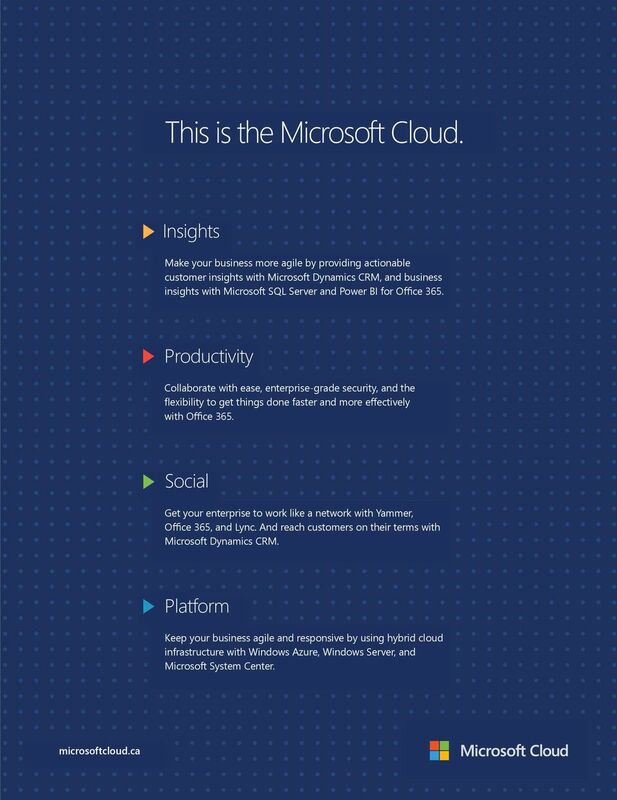 The Microsoft Cloud provides a connected cloud platform that gives you the freedom to deploy and use technology in the way that makes the most sense for your business. The cloud that scales when you need it. 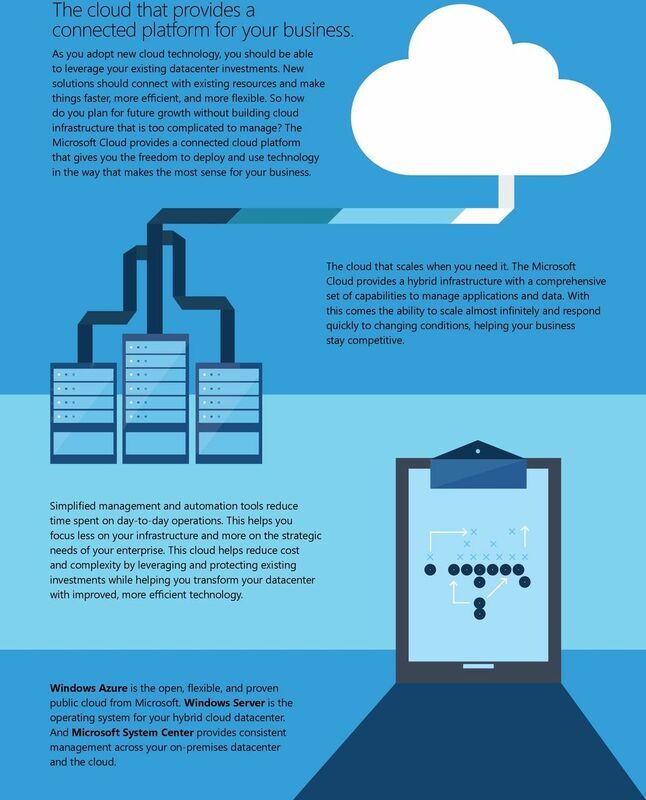 The Microsoft Cloud provides a hybrid infrastructure with a comprehensive set of capabilities to manage applications and data. With this comes the ability to scale almost infinitely and respond quickly to changing conditions, helping your business stay competitive. Simplified management and automation tools reduce time spent on day-to-day operations. This helps you focus less on your infrastructure and more on the strategic needs of your enterprise. This cloud helps reduce cost and complexity by leveraging and protecting existing investments while helping you transform your datacenter with improved, more efficient technology. Windows Azure is the open, flexible, and proven public cloud from Microsoft. Windows Server is the operating system for your hybrid cloud datacenter. And Microsoft System Center provides consistent management across your on-premises datacenter and the cloud. Transform the datacenter. Ovidiu Pismac MCSE Security, CISSP, MCITP Virtualization, MCTS Forefront Microsoft Romania ovidiup@microsoft. Ariett Purchasing & Expense Management. Go Paperless, Go Mobile, Go Easy. Software Assurance Planning Services UNDERSTAND THE VALUE, PLAN THE SOLUTION Software Assurance Planning Services provide expert guidance to help you plan and manage your next Microsoft software deployment. Cloud Services. More agility. More freedom. More choice. Mobilizing Your CRM. Whitepaper. August 2011. Exploring the Benefits and Considerations. Copyright 2009-2011 CWR Mobility B.V.
Leveraging the power of innovation to improve business performance The Power of Three The digital revolution has created three forces that are colliding and conspiring to disrupt business as we know it. SERVICES SOLUTION SUMMARY SEIZE THE ADVANTAGE From the workplace to the datacenter, the enterprise cloud footprint is growing. It delivers on-demand development resources. It accommodates new digital workloads. Office 365 Fall Updates FAQ: New Office 365 Plans for SMBs and more! Software defined networking Your path to an agile hybrid cloud network Is your enterprise network ready for the latest business and consumer trends? Cloud How easily can your users connect to cloud resources? Simplifying the user experience and helping organise, sync and share content.